With the increasing demand for sustainable and consistent sources of renewable energy and an increasingly urgent need to integrate these inherently unpredictable sources into our existing highly organised electricity supply networks, a new way of managing the supply of these energy resources is required. Solar energy supply is by definition unpredictable, whilst the supply and demand of electricity from traditional grids needs to be very predictable. Efficient energy management is the solution to a consistent and predictable supply of renewable energy, allowing the sun to become our biggest source of electricity. In Solarclarity’s EMEC renewable energy solutions are developed, tested and implemented to be the essential link between production and consumption of renewable electricity. 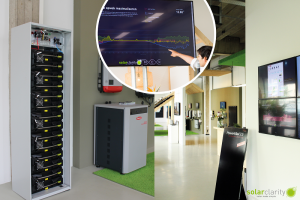 Load-balancing through batteries; demand control for large scale consumers; trade on the energy markets and even peer to peer transactions are possible and demonstrate how the solar market creates new business opportunities that can dramatically change the existing energy market… not in the long run, but in the very near future. With a conference and opening ceremony by Jan Vos (former Dutch politician of the Labour party ‘PvdA’) and Liesbeth van Tongeren (Dutch politician of the Green party: ‘GroenLinks’). 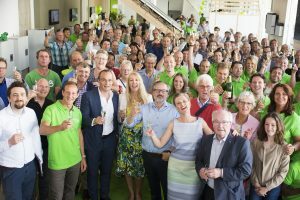 Solarclarity has officially opened its Energy Management Experience Center (EMEC). The Dutch Television channel, RTL7, filmed at Solarclarity’s EMEC for their program “Doe maar duurzaam” (about sustainable energy). The item about Solarclarity’s EMEC was was broadcasted in June 2017. The Solarclarity Energy Management Experience Center (EMEC) is open on weekdays from 9 a.m. to 5p.m. Please fill out the form below if you are interested in making an onsite appointment to visit the EMEC. With how many people would like to visit the EMEC ? Please use the below text field to send us your question.